As oil and gas development intensified in Garfield County during the last decade, the communities of Rife, Silt, and New Castle sought a means to address community concerns regarding the impacts of drilling. The Rifle, Silt, New Castle Community Development Plan (RSNC-CDP) was created in 2005 through a collaborative process, supported by the Grand Valley Citizen’s Alliance, that brought together the community and two energy companies, Antero Resources Corporation (Antero) and Galaxy Energy. The RSNC-CDP encourages communication and cooperation between community members and the natural gas industry in hopes of minimizing the impacts of oil and gas development in this primarily residential and agricultural area. Galaxy Energy is no longer an active party to the RSNC-CDP. Orion Energy Partners, who had exploratory wells in the Garfield Creek State Wildlife Area outside of the town of New Castle as of 2008, acquired Galaxy. Orion’s development in the area is unknown, but the Garfield Creek State Wildlife Area is not within the boundaries of the RSNC-CDP. The RSNC-CDP is built around the vision of “responsible development” on the part of industry. It sets guidelines, agreed upon by community participants and industry leaders, for industry to follow for a full-field development. This means employing Best Management Practices (BMPs), clustered well development, managing development in sensitive areas, monitoring air and water quality, and addressing community health and safety. Though it is not legally binding, the RSNC-CDP was expected to reduce conflict between industry and residents of Garfield County through responsible development and continuing communications. Performance of Antero in subsequent implementation of the agreement has had mixed reviews. At least part of the community feels that Antero has not done enough to reduce the company’s impacts. Residents are claiming to experience rashes, smells of rotten eggs in the atmosphere and from their water, nosebleeds, and headaches. South of Silt (outside the CDP boundary), a well blowout put residents at risk with air contamination. The emergency response from Antero and the county was slow to shut off the leak, and Antero failed to notify residents of the compounds to which they were potentially exposed. Other issues include poor construction of a pipeline running through a resident’s property, and problems with fumes and fracing. On the other hand, Antero is praised for some of its practices including its reclamation, down-lighting, water management, vehicle controls and pitless drilling. In 2009, conflict erupted as the community felt Antero had betrayed them. As part of the RSNC-CDP, Antero agreed to inform the community of their actions pertaining to drilling and to incorporate community input into their plans of development. When Antero submitted an application to the Colorado Oil and Gas Conservation Commission (COGCC) to increase drilling (to downspace from 1 well per 160 acres to 1 well per 10 acres) on Silt Mesa, north of the Colorado River, the community was neither informed nor aware of the application. Once discovered, Garfield County filed, at the community’s request, an intervention with the COGCC to postpone Antero’s application. To address the conflict, Antero had to communicate with the community and the BOCC through public meetings to reach a plan acceptable to those involved. Antero subsequently decided not to pursue their immediate plan to intensify drilling in the area, but they may submit another application to do so in the future. The RSNC-CDP gave the community the opportunity, if not the legal authority, to hold Antero to their commitment of responsible development and communications. Even though this conflict arose, the company seems to be back on track with plans to avoid another backlash from residents by maintaining contact with the community. This conflict over down-spacing and the efforts of all stakeholders to deal with it provide insight into the weaknesses of this type of agreement and how it can be more effective. Of primary concern to some in the community is that the agreement is non-legally binding. Because of this, not only can Antero leave the agreement at any time but also Antero can pick and choose which parts of the RSNC-CDP to implement. Those they have chosen, such as better reclamation practices, facility lights turned down to minimize light pollution, and quieter generators, have been successful. In contrast, Antero’s effort to maintain good community relations and broaden their community outreach has not proven as successful, even though Antero has made efforts to reach out to landowners directly affected by development through meetings, See Communications. Currently, a newly developed community group, Rifle, Silt, Peach Valley, and New Castle Alliance (RSPN), is working on changing the RSNC-CDP into a Comprehensive Drilling Plan which can then be enforced by the COGCC. Further, the company must voluntarily enter into the agreement. This presents several challenges. Having an agreement can create expectations in the community. Even though the community may wish to hold every operator in the area to the same guidelines as Antero, not every operator is willing to commit to the agreements made by Antero or to any agreement. A main reason for Antero’s intensive work with the community is because they proposed drilling in sensitive areas, and the plan presents a good public outreach opportunity. Operators working in less sensitive areas may not feel compelled to make similar agreements. The RSNC-CDP is specific to the RSNC community. Other communities, such as Battlement Mesa, may want a CDP with Antero, but they are unlikely to accept “imposition” of the RSNC-CDP on their community without participating in the same kind of collaborative effort. On the other hand, the RSNC community seems to assume that the agreement made in the CDP area should apply to all Antero operations. Unless Antero makes the same assumption, conflicts cannot be avoided. Another current challenge is that the plan establishes guidelines for Antero to follow once they are in the stage of full-scale development, but at this point, Antero is still evaluating exploratory wells. Consequently, the plan provisions may not precisely fit the current issues with the development. This can affect BMPs mentioned in the RSNC-CDP such as reducing truck traffic in the area. It may also explain why Antero would not have considered plans for well spacing to be within the scope of the RSNC-CDP. Besides reducing impacts from oil and gas development, the agreement is intended to promote more effective communication between stakeholders. Implementing this type of agreement can be difficult particularly when key players involved in creating the plan and in leading discussions between industry and the community leave the area or become overwhelmed with other responsibilities. In this case, key players in the negotiations from the community and Antero have moved on. 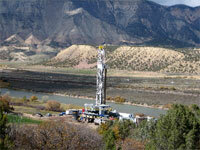 As their drilling plans changed, it may have been unclear who in Antero should communicate with whom in the community. As a result, both the community and Antero were caught off guard when Antero proposed increased drilling on Silt Mesa, and the community opposed it. Leaving no specific successors to maintain communication and implement the agreement, the collaboration became less proactive and the community was unsure as to who or what organization would implement the plan. If maintaining consistency in involvement is not possible, a formal group structure may be critical for maintaining effective community involvement. Since development of the agreement, some participants have moved away, some residents have lost interest or been otherwise unable to remain involved, new residents have moved in and may be unaware that the RSNC-CDP exits. At present, the “community” is a collection of residents that have various concerns they wish Antero to address. GVCA is still involved along with RSPN but neither the residents nor this group has a well-established structure with a decision making body. Having several community members expressing their concerns and no one group taking the lead in discussions with Antero, communication and finding solutions has proven to be a more difficult process. On the other hand, any one community organization may not represent the entire community as a whole nor share the community’s diverse opinions. Regardless of the leadership structure that is used, leadership that maintains an impartial attitude towards industry during collaborative meetings can create an open working relationship that would be beneficial to all stakeholders. Companies involved in this type of agreement can also work on their communication with community and being more receptive to their concerns. Lack of communication and broad community outreach by Antero has been the main criticism of the company. After the RSNC-CDP was created, Antero told the Silt Mesa community that they planned to drill south of the Colorado River and abandon their plans of development north of the river in the area covered by the CDP. Consequently, Silt Mesa residents were upset when Antero began development in their community without additional notification. In many cases, Antero has also reached out only to landowners and royalty owners to describe their plans, not to all area residents. This may be due to Antero’s method of advertising rather than intent to limit participation, but it would be more productive to have meetings open to all to increase transparency. Using multiple methods of sending out meeting notifications might also help. Further, Antero rarely has a question and answer session during public meetings, and some residents perceive Antero’s responses to certain questions, such as regarding hydraulic fracturing, to be very vague. This can hinder a good working relationship between industry and the community even when the company has good intentions or a good record in mitigating their development impacts. Overall, a community development plan is a great option to bring industry and community together to form a good working relationship. The specific RSNC-CDP can always be improved upon with new information regarding oil and gas development, technology, and related research, such as the Battlement Mesa Health Impact Assessment, to quantify the risk and to support the implementation of BMPs laid out in the plan. It further allows community to manage the growth of the natural gas industry so that residents of this area can sustain their quality of life.